Posted Nov 16, 2018 by Eds. 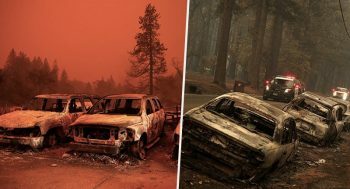 As firefighters in California battle to contain the deadliest and most destructive wildfire in state history, a climate scientist says the reality on the ground is surpassing what a government report projected just months ago in assessing the links between climate change and an increasing frequency and severity of wildfires in the state. After a dry summer and fall, powerful winds over the past week swept flames through the town of Paradise in Northern California, killing at least 48 people and destroying more than 7,500 homes, officials said Tuesday. 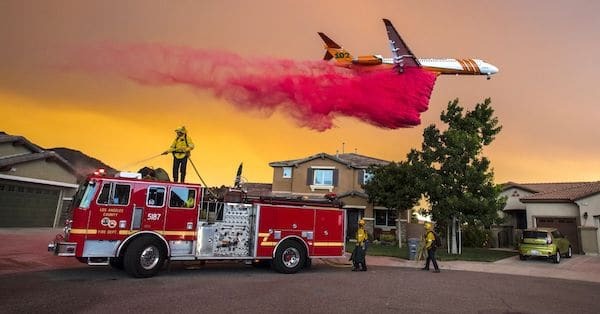 Two more fires near Los Angeles chased more than 200,000 people from their homes as the flames quickly spread, adding to a string of fires that have caused billions of dollars in damage this year. “I think what we have been observing has consistently been outpacing what we’ve been predicting,” said LeRoy Westerling, professor of management of complex systems at the University of California, Merced, who modeled the risk of future wildfires as part of the California Climate Change Assessment released in August. The report estimated that the average area burned by wildfires would increase 77 percent by 2100 and the frequency of extreme wildfires would increase by nearly 50 percent if global greenhouse gas emissions continue at a high rate. Westerling said wildfires are likely to continue to outpace those recent projections because the underlying global climate models used underestimate precipitation changes in California, including periods of prolonged drought. California overall experienced another hot, dry summer and fall that left much of the state with well below normal precipitation. Its population has also spread further into wildland areas, creating more potential ignition sources for wildfires, such as vehicles and power lines, and putting more homes and people in harm’s way. After a series of devastating fire years, California increased its funding of fire prevention and forest health to $350 million in 2017, a 10 to 20 fold increase over prior years according to Scott Witt, Deputy Chief, Fire Plan & Prevention for Cal Fire, the state agency tasked with fighting wildfires. Legislation signed into law in September will provide an additional $1 billion for fire protection efforts in the state over the next five years with funding coming from the state’s cap-and-trade climate program. The funding follows an update in August to Cal Fire’s “Strategic Fire Plan,” which acknowledges the role climate change plays in increased wildfires as well as the role that healthy forests play in sequestering carbon. California oversees only a portion of the wildland areas in the state, though. Federal agencies, including the Forest Service, Bureau of Land Management and the National Park Service, own and manage 57 percent of the approximately 33 million acres of forest in California, according to the University of California’s Division of Agriculture and Natural Resources. President Donald Trump drew widespread backlash, including from firefighters who called him “ill-informed,” after he wrote on Twitter on Sunday that poor forest management was solely to blame for the fires and he threatened to withhold future federal funding.